2) We offer $75 worth of FREE added-on services such as hot stone, aromatherapy, coconut oil, hot towel cleanse, cupping and more. How amazing will your massage be with all these perks? 3) We provide 9 different massage techniques and discipline of massage therapy to ease your pain, scar tissue, and stress tension. Experience Deep Tissue, Traditional Thai, Combo Massage, Relaxation, Foot Massage, and more. 4) Each and every one of your massage is catered to YOU. No more same thing over and over - unlike other autopilot massage treatments elsewhere. 5) All of our massage therapists are registered. We even have a few massage therapists that were medical doctors from overseas. That's the care level you deserve. We are hidden, for a reason. In the middle of downtown Calgary where the hustle and bustle of corporate world can be demanding, we are tucked away at the back, facing the Bow River, with an unobstructed view of Riverfront Ave and the river walk pathway. Floor to ceiling glass allowing the sun and daylight shine in. Nature's beauty brought from the outdoors into the healing space at Exige Medi Spa. Did you know? We have been referred to as the $3 Million view - that's how much the law firm above us paid for their office. With our open concept room arrangement, orient decor and Zen set up, it's a mini-vacation or staycation escape to the Orient for an hour or two. Please give yourself the time to find us and come early to enjoy our massage chairs, facing the $3M view and in complete quiet bliss before your massage with us. Text or call us should you have any questions (403) 918-8936 We look forward to serving you. Excellent and relaxing. A great first experience. All around amazing experience! Pulled a muscle in my back and couldn't wait until next week to see my Chiro because of the pain. 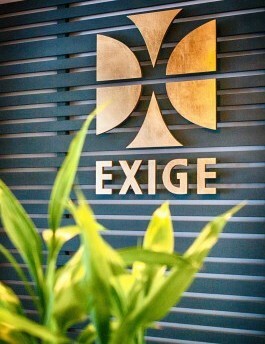 Luckily I was able to get a same day appointment at Exige. Arriving at the spa, Dr. Amanda was very warm and welcoming, which goes along well with the interior and décor of the spa itself. The massage itself was exactly what I needed. In the past I've hated getting deep tissue massage because of how painful it was just getting the massage, but when Dr. Amanda went in to get the deeper muscle problems, it was probably the most relaxing part of the massage as I could feel the muscle giving way to her masterful hands. It was nice being able to put on my jacket when leaving and not wince in discomfort. As a testament to Dr. Amanda's commitment to customer service, during the massage I swore I felt a third hand before realizing a second person was working on me. After the massage she explained that my back was in such a bad way that she didn't feel an hour was long enough. Instead of up-selling me or doing half the job, she brought in a second person to make sure my back was done right. I was sold on coming back just because of how relaxing and stress relieving the massage was, but the customer service I received ensured I would become a regular. Thank you for booking with us; We are eager and excited to serve you. Please note the following to ensure the best massage experience: 1) We do require a 24-hour cancellation notice or a full charge will be applied. 2) To not CUT into your treatment time, please arrive 10-15 min early to prepare for your session. ie: fill out forms, bathroom break, disrobe and prepping, etc. (We have over 7 FREE luxury added-on-services such as cupping, hot stone, aromatherapy and more waiting for you, so come early and fill out all the services you want to indulge, on us.) 3) Exige does NOT accept any ACTIVE or open MVA or WCB claims. Please do notify us ahead of time should this be the case and we can refer you. Should you book an appointment and does not disclose this information in advance, we reserve the rights to cancel the appointment on site. To avoid the disappointment pls notify us ahead of time, so we can assist you. 4) Exige does not direct bill to any insurance providers. We will email you the receipt after your treatment and for a fast and easy reimbursement of your claims, you can submit it online. On average, reimbursement will be deposited into your account within 48 working hours. 5) All our registered massage therapists are claimable with all insurance carriers. If you are a client out of town or country, please verify with your insurance carrier of all their mandates ahead of time and we will gladly reserve a booking for your massage needs. We look forward to pampering you. "Natural Healing with the Spa Experience." #6, 110 - 2nd Ave S.E.